HUANGJIANG BD believes and insists in continuously pursuing the best quality, conforming to environmental requirements, and constantly enhancing the safety and hygiene of the working environment. It has acquired various certificates in related fields through the years, and in the future it will continue to strengthen its operating performances and to raise customers' satisfaction. 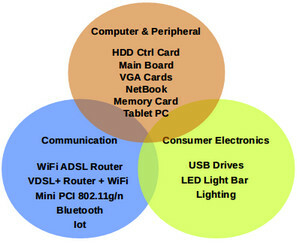 The current product profile of HUANGJIANG BD includes PC, storages (USB flash drive, HDD), consumer electronics (TFT-LCD), communication products (wireless), IPC (gaming machines, security, communication), and it actively develops its automotive electronics business. Other products HUANGJIANG BD strongly push include Thin Client and UMPC, which now belong to the niche products with a small quantity, but possess a fast-growing potential. A long-term partner with famous international companies already, HUANGJIANG BD receives customers’ awards and recognition every year. Other than enhancing its manufacturing assembly capabilities, HUANGJIANG BD will fully utilize its cost advantages, introduce more value-added service, extend its product innovation and introduce a better market response, and therefore it can offer a complete service and support, creating a win-win situation for all customers. The gbm group has built a complete integrated supply-chain service including PCB, plastic-mold tooling, injection, painting, PCBA, and system assembly. During the stage of NPI (New product Introduction), it offers complete and fast product verification analysis and correction advices. Its milti-layer, advanced assembly technology can produce products of tiny parts like 0204, satisfying the mainstream market trend for ultra-compact devices, and it has a lead-free process for a high yield rate in mass production. HUANGJIANG BD will constantly integrate all functions of SMT, injection, and system assembly in the future, to present a better integrated customer service and grow into an all-dimensional production center. At the same time, it will strive to maintain major customer relationship, actively develop new product lines, and deepen the strategic-partner relationship with customers.